Buffalo Bills wide receiver Robert Woods knows about adapting to tough situations. When the 2013 second-round pick was asked to focus primarily on blocking earlier this season, he took the task in stride, showed a knack for making key blocks, and handled tricky questions from the media on why he was locking up with defenders more often than being targeted for catches—and all in a very stately manner. No coach was besmirched, no responsibilities were shunned. Woods’s reception numbers picked up as the season went on until he suffered a hamstring injury against Washington and was placed on injured reserve. Woods’s composure may have motivated local television station WBBZ to hire the University of Southern California alumnus as host of the weekly Bills talk show In the Zone, which airs live from the Eastern Hills Mall every Monday during the regular season. Woods has been off the show since his injury, with Bills great Steve Tasker and others filling in for him. 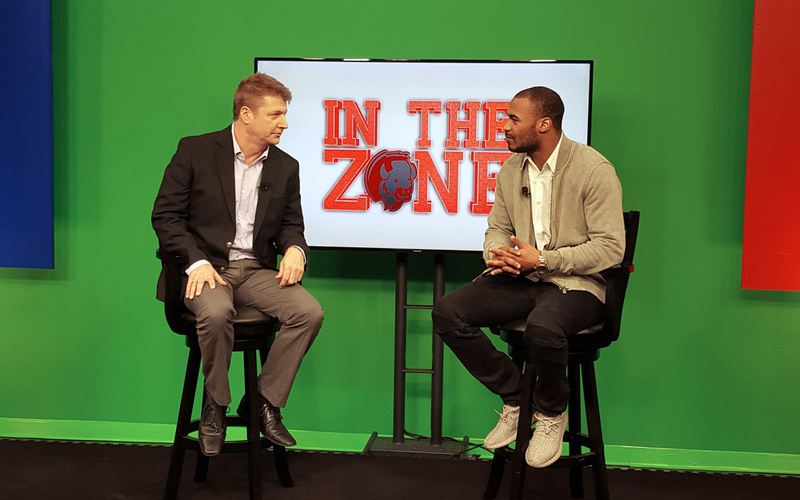 In the Zone replaced The Fred Jackson Show after Jackson, the popular former Bills running back, was released last preseason. WBBZ producers were put in a difficult spot, as preparations were well under way for a fourth season with Jackson hosting when the announcement was made. In the Zone co-host Dave Jickster, who also had an on-camera roll on The Fred Jackson Show, recalls Jackson’s surprising exit. “When he got cut, it was almost a panic situation for everyone here. We didn’t know what we were going to do,” Jickster said. The possibility of a new player filling in as host each week was discussed but abandoned. For Woods, who had appeared as a guest on The Fred Jackson Show, the offer involved the challenge of filling some big shoes, with Jackson achieving massive popularity in the Buffalo community. Woods’s television career is off to a good start. In the Zone is a lean, well-produced 30 minutes of follow up from Sunday’s game and conversation leading up to the next. Woods’ confidence continues to develop with each episode. Still, Woods says he is camera shy. He doesn’t know if his post-NFL career involves a role on television, although he does have one major supporter on that path. “This is kind of my first jump into it, one my mom kind of encouraged me to get into. She wants me to be a commentator once I’m done,” he said. Getting NFL players to commit to guest spots on In the Zone on a Monday evening can be tough, he says. “[Monday] is really the only off-day that we have. And especially because I try to base [the guest selection] off of performance. And then with a loss, that definitely hurts,” Woods said. Even without the occasional guest, Jickster and Woods are able to hit the topics that Bills fans are wondering about, including questionable play selection and penalties. Again, Woods manages to address the issues without throwing anyone in the Bills organization under the bus. “Our show has energy and it’s an honest show. Robert is as honest as can be with his answers,” Jickster said. The show also has its candid moments, like when Woods critiqued Bills running back Mike Gillislee’s awkward Week 13 touchdown celebration, or when Woods thoughtfully answered a studio audience member’s question on why his favorite movie is Apocalypto. “It’s a pretty laid-back show. I love it when the fans have great questions. That’s the tricky part, when they hit you with some wild question that’s non-football related. You never know what you are going to get,” Woods said. In the Zone airs live Mondays at 7pm on WBBZ, Channel 67. Free reservations to be part of the studio audience can be made at wbbz.tv.